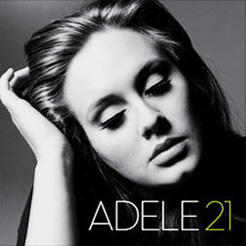 “21,” the latest album by British recording star Adele, is a remarkable mix of alternative rock, rhythm and blues, jazz, country, and just of bit of gospel. Beginning with the award-winning “Rolling in the Deep,” a tall finger tribute to her ex-boyfriend (not her exact words), Adele’s smoky tones and passion are that of a heartbroken, mature woman. The truth is, the album is called “21” because that was her age when it was produced. The album features 11 songs and while each differs in genre and background music, all reflect a recent broken relationship. “Don’t You Remember” is a country tune, co-written by Adele and Don Wilson, that begs her ex to think about the good times. “Rumor Has It” is a percussion-driven jazz tune about the other woman. Piano and chorus make “Take it All” a throaty, gospel offering. Overall, with the exception of “Lovesong,” which drags a bit because of the repetitive lyrics, 10 of the 11 songs are good listening and worth the price of the album. “21” is available at Amazon, and Barnes and Noble for $9.99, or downloadable from iTunes for $10.99.